The Tacoma Education Association said 98 percent of members in attendance Friday voted to approve the deal, which includes an average 14.4 percent raise for teachers. Educators in Tacoma overwhelmingly approved a new contract Friday that includes an average 14.4 percent raise for teachers in Tacoma Public Schools. A video from a general membership meeting of the Tacoma Education Association, which represents educators there, showed teachers cheering after a vote in which 99 percent of members in attendance approved the contract deal, which the union and school district had announced late Thursday. Effective Sept. 1, the tentative agreement would raise the starting pay for teachers in Tacoma from $45,500 to $54,308. The maximum salary would top $108,520, up from about $90,900 currently. 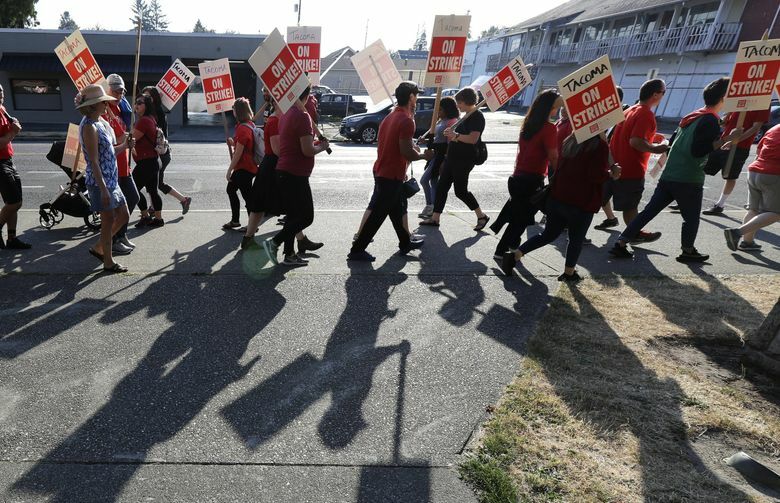 The deal, which still requires School Board approval, brought an end to a seven-day teacher strike in Tacoma that delayed the opening of school. Classes are set to start Monday. “I’m not sure whether to laugh or cry,” Trish Maxwell, a math teacher at Stadium High, said immediately following the vote. She had worried that this school year might have been her last in Tacoma and considered applying to neighboring school districts offering better pay. Under the contract deal, Maxwell estimates she will make about $14,000 more this year. “This has been hard. It’s been very hard,” she said, voice cracking with emotion. At Friday’s meeting, union officials told members that the pay hikes would bring Tacoma’s salaries for teachers into the top three among neighboring districts, Maxwell said. “We will offer among the most competitive salaries in the Puget Sound region and retain our advantage to attract and retain the best educators,” the district said on its website. The tentative agreement also includes a 19 percent raise for office professionals, according to the district.